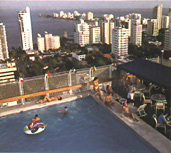 Located on one of the most beautiful beaches in Cartagena, this 22 story, 200 room modern hotel offers deluxe accommodations. Only 10 minutes from the Walled City and surrounded by numerous cafes, cantinas and nightclubs; its Bocagrande location is ideal for easy access to all that Cartagena has to offer. The Hotel has recently been remodeled to offer patrons deluxe air-conditioned accommodations. All of the spacious rooms are tastefully decorated and offer cable TV, room service, as well as laundry service. Each room includes a spacious balcony, ideal for enjoying a romantic evening. Capilla Del Mar offers restaurants and bars for any occasion. The Las Ninfas is a very comfortable and informal restaurant located on the patio overlooking the ocean, perfect for enjoying a light dish or a delicious buffet breakfast. If you are looking for something a bit more formal try the �Toca de Oro� three time award winner for its delicious and diverse dishes. Or simply relax and take in the breathtaking sunset atop the hotel in the rotating rooftop bar. This upbeat bar offers snacks and a variety of music, as well as some of the most spectacular views to be found in Cartagena!. When it�s time to relax or get a little exercise in, you will find the Eros gym located on the 4th floor as well as a refreshing swimming pool located outside on the 22nd floor. Although we never recommend mixing business with pleasure, for those of you who must there is a full service business center located in the hotel for all your business needs. We are proud to offer the services of the Capilla del Mar to you as part of your Cartagena Romance tour and are confident that it will only add to this once in a lifetime experience!